Who knew that Natasha Allegri, creator of Bee & Puppcat, was the one who came up with the idea of gender-swapping the main characters of Adventure Time to create Fiona and Cake? And who knew that her Kickstarter campaign for Bee & Puppycat would become the highest-funded web series in Kickstarter history? (Well, okay, if you’re a fan of hers you probably knew those things!) All of this was more than enough inspiration for Boom! 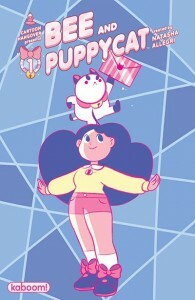 Studios to launch their own full-color Bee & Puppycat comic book mini-series under their Kaboom! imprint. It’s out there now (written and illustrated by Natasha Allegri with help from Garrett Jackson), and you can read more about it at the Kaboom! web site. It's also out of stock, at least right now. Hopefully that can be rectified.